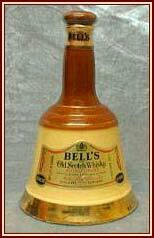 The Story of Bell's Decanters Courtesy of United Distillers plc. 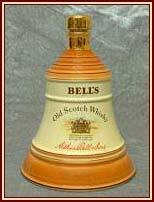 In 1988, the revised range of Bell Decanters was introduced containing Bell's Extra Special Blended Scotch Whisky with a new bell shape, very similar to the Bell's Extra Special neck tag, and new colours of tan and cream reflecting the Bell's House style. The Decanters are still made for United Disillers plc by Wade Ceramics plc and are hand-finished with 24 carat gold. Each comes packed in a presentation canister with a carry cord. The range size is 75cl, 37.5cl, and 18.75cl. A 12 year old has been added to the range. The first four in a series of Christmas Decanters has been produced which are trimmed in dark green. The theme of the 1988 issue was ''We Wish You A Merry Christmas'', the 1989 edition depicted a Perth Winter Scene and the 1990 edition featured the Blair Athol Distillery. The 1991 Decanter continues the Art of Distilling theme and shows a picture of a Still Room and is in the new 70cl size. The 1992 Decanter is a new design with a predominately rich green finish portraying the Art of Cooperage and is the pattern for the next four years, thereby making another series of four. The 1993 edition illustrates the Maltmans Art whilst the 1994 shows the Blenders Art. The final Decanter in this series , 1995, depicts the Cellermans Art. Another new series was introduced for Christmas 1996, this time in the 'house colours' of United Distillers. The Decanters are mainly cream with a rich dark red at the shoulder and are hand finished in 24-carat gold The 1996 depicts the Ingredients of Quality and the 1997 the Eight Core Whiskies of Bells eight year old. In the 1980s, an interesting and attractive addition was made to the family with the production of a white porcelain Royal Wedding Decanter to commemorate the marriage of Prince Charles and Lady Diana on 29th July 1981. This limited run item was so popular that the complete stock was sold within months, with a large proportion going to overseas markets. 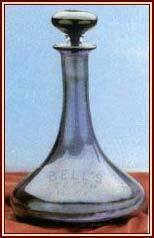 With the birth of Prince William on 21st June 1982, Bell's decided to introduce another commemorative Decanter, this time in a 50cl size, and again in a limited edition. 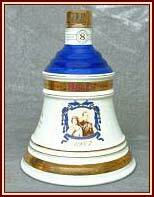 Since then, Bell's have continued the tradition of commemorating special occasions in the lives of our Royal Family with limited edition Decanters for the birth of Prince Henry (15th September 1984), the Queens 60th Birthday (21st April 1986), Prince Andrew and Miss Sarah Ferguson's wedding (23rd July 1986), the birth of Princess Beatrice (8th August 1988) and finally, Princess Eugenie (23rd March 1990). August 1990 saw the issue of a Decanter to mark the Queen Mother's 90th Birthday. 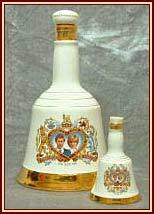 All except the Prince William and Prince Henry Decanters, which were 50cl, were produced in the 75cl size. A Decanter to celebrate the Golden Wedding Anniversary of The Queen and The Duke of Edinburgh (20th November 1947) has also been produced, this time in the 70cl size. All these Royal Decanters in their striking white colouring are prestigious additions to the range and are in keeping with the quality and tradition of their predecessors.